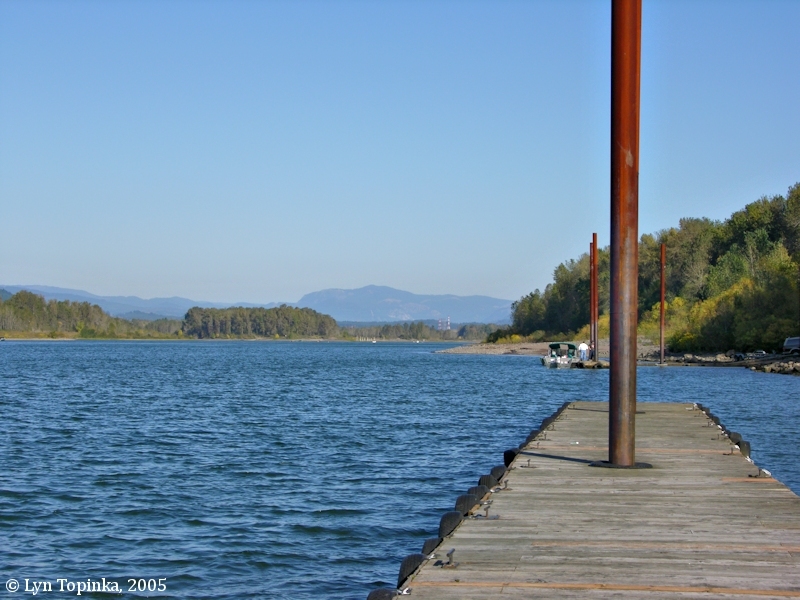 "Pierce Island and Ives Island, Washington"
Click image to enlarge Pierce Island, Washington. Pierce Island as seen from boat launch at Beacon Rock State Park, Washington, off of Washington State Highway 14. Image taken October 27, 2004. 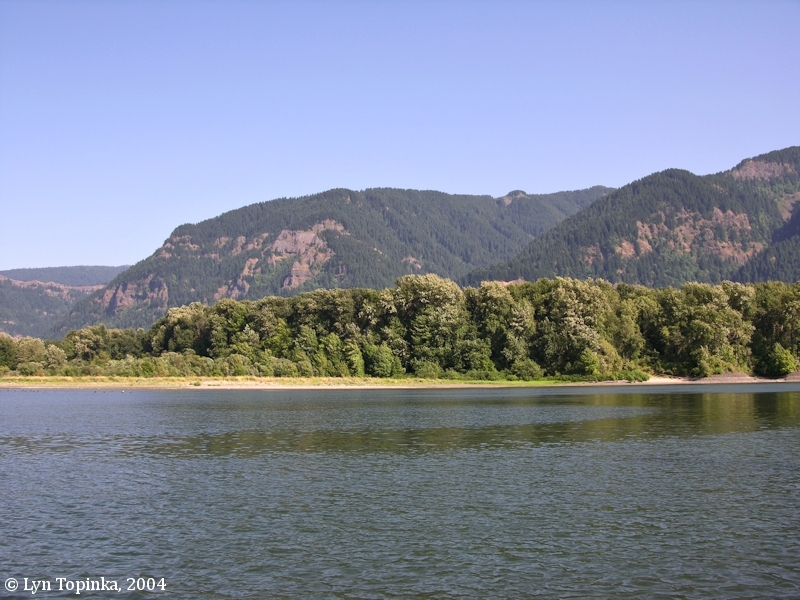 Pierce Island (westernmost) and Ives Island (easternmost) lie on the Washington side of the Columbia River just downstream (south) of Beacon Rock and Pierce National Wildlife Refuge. 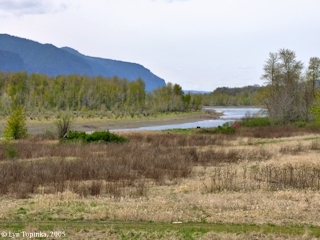 Behind Pierce Island lies Woodard Creek where it merges with the Columbia River. Pierce Island and Ives Island are remnants of the Bonneville Landslide. This matches with their route map [Moulton, vol.1, map#79] which shows three small islands just off the Washington shore by "Beatin Rock" (Beacon Rock), just downstream of a much larger island, "Strawberry Island", known today as Hamilton Island. The 1860 Cadastral Survey by the Surveyor General's Office, Washington Territory, shows two islands in this area. On the T2N, R6E, survey Beacon Rock shown but not labeled, with a large island just offshore labeled "Pierce's Island". On the T2N, R7E survey, a smaller island just upstream (today's Ives Island) is shown but not named. The 1911 USGS topographic map of the area, the Mount Hood Quadrangle (1911, 1:125,000) shows two islands, the upstream-most one not identified, while the downstream-most one is identified as "Pierce I.". 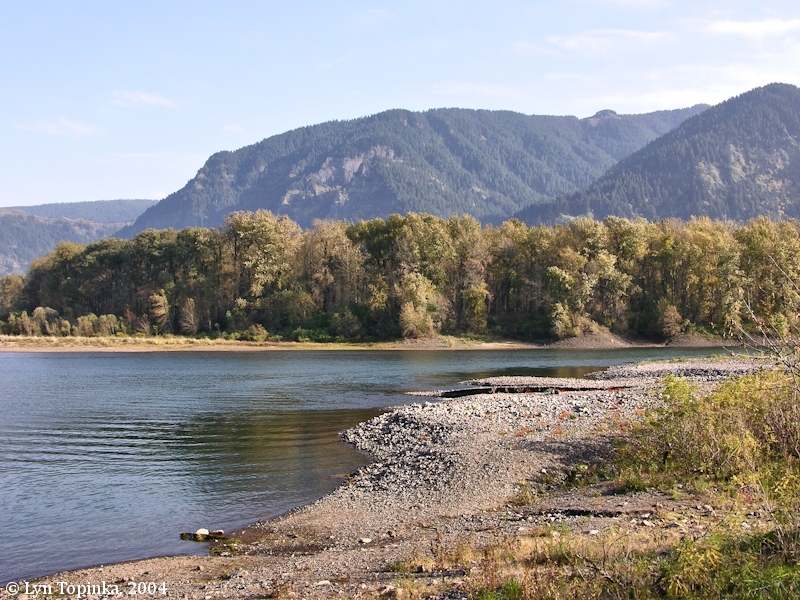 Pierce Island and Ives Island, along with Hamilton Island (located just upstream), are remnants of the Bonneville Landslide which temporarily blocked the Columbia River and was birth to the legend of the Bridge of the Gods. 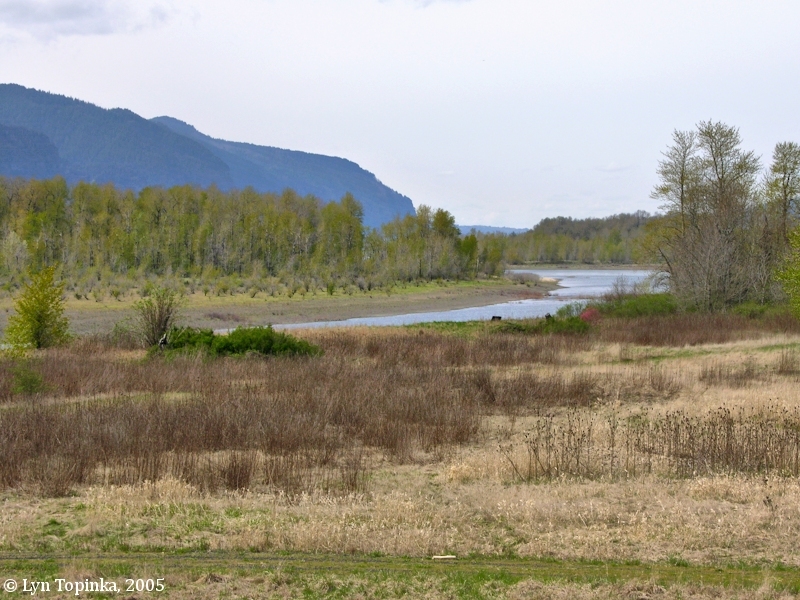 Click image to enlarge Pierce Island and Woodard Creek, Washington. Pierce Island (left), Woodard Creek (running through lower middle ground), the Columbia River (left to center) with Warrendale, Oregon, in the background. View from boat launch at Beacon Rock State Park, Washington, off of Washington State Highway 14. Image taken October 27, 2004. Click image to enlarge Columbia River from Beacon Rock. 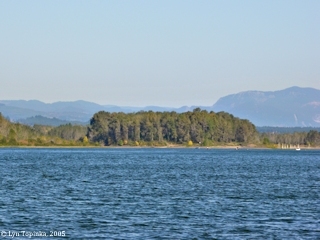 Pierce Island is on the right and Pierce National Wildlife Refuge is on the left. Aldrich Butte is just visible on the left. Image taken September 26, 2016. Click image to enlarge Ives Island from Hamilton Island, Washington. Pierce Island is in the background, right. Image taken April 2, 2005. Click image to enlarge Ives Island and Beacon Rock, Washington. View from Hamilton Island, looking downstream. Image taken April 2, 2005. Pierce and Ives Islands, etc. Pierce Island is a 200-acre Nature Conservancy preserve dedicated to protecting native riverine flora and fauna. The island is home to a variety of birds and mammals, including geese, ducks, ospreys, and beavers. 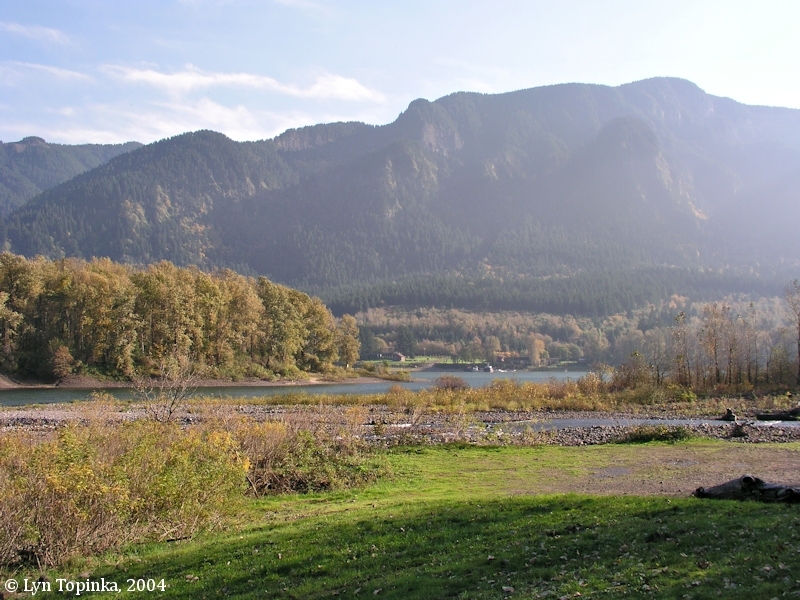 No camping, pets, or fires are permitted on Pierce Island, and visitors are requested to only stay for a brief time and leave no trace. The U.S. Bureau of Land Management's General Land Office (GLO) Records database shows a Thomas Pierce being issued a land title on July 2, 1866, for 147.34 acres of parts of T1N R6E Section 5, under the 1820 "Sale-Cash Entry". The 1860 cadastral survey map (tax map) has the island labeled "Pierce's Island". "The plaintiff in the case alleged that his wife took passage on the steamer Inland Flyer for Washougal. The master of the steamer refused to land at that place, and carried her to Mosquito island, about twenty miles above, and put her ashore with the understanding that the Dalles City would stop and pick her up." 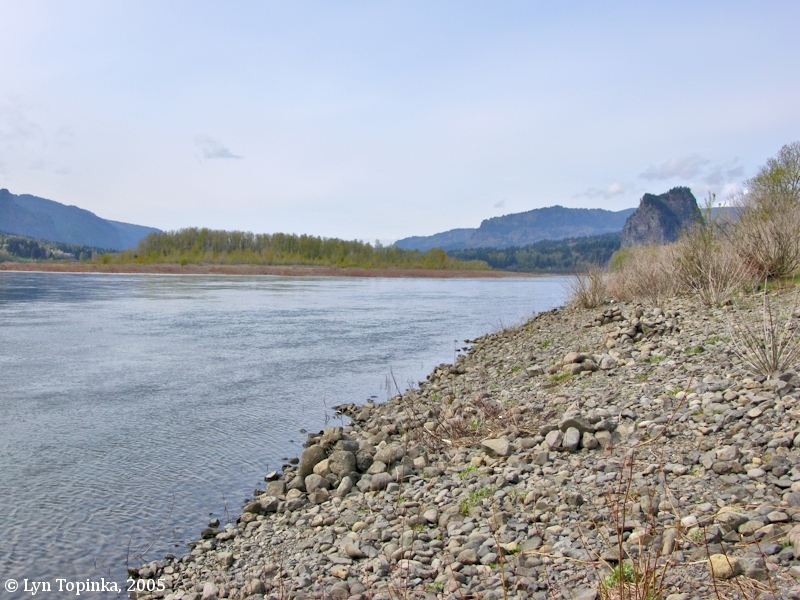 "A Columbia River refuge: WHY YOU SHOULD VISIT. A mighty river. Shady woodlands of black cottonwood, willow and ash. And sometimes the insects that gave this special place its original name: Mosquito Island. 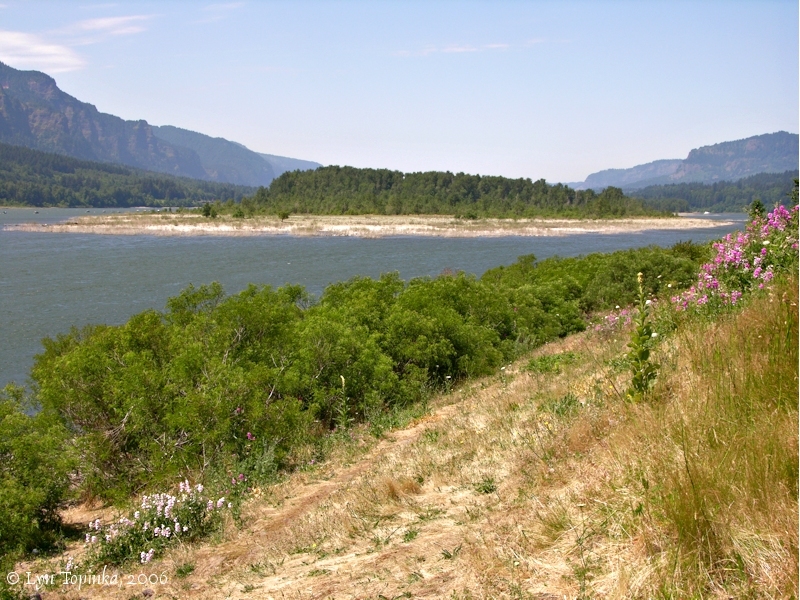 Situated in one of the last major free-flowing stretches of the Columbia River, the Pierce Island Preserve offers spectacular views of the Columbia River Gorge and Beacon Rock." Click image to enlarge Pierce Island, Washington. Pierce Island as seen from boat launch at Beacon Rock State Park, Washington, off of Washington State Highway 14. Image taken August 1, 2004. 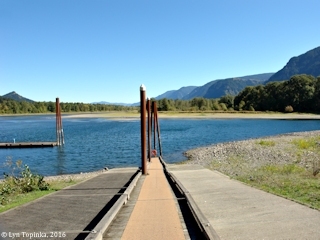 Click image to enlarge Pierce Island, Washington, and the boat ramp near Dodson, Oregon. Downstream tip of Pierce Island. The Bonneville Dam area can be seen in the background. Image taken October 22, 2005. 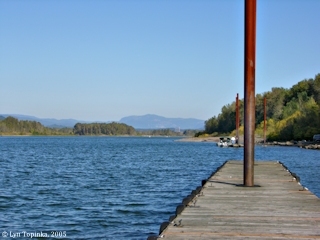 Click image to enlarge Pierce Island, Washington, from the boat ramp near Dodson, Oregon. Downstream tip of Pierce Island. Image taken October 22, 2005. 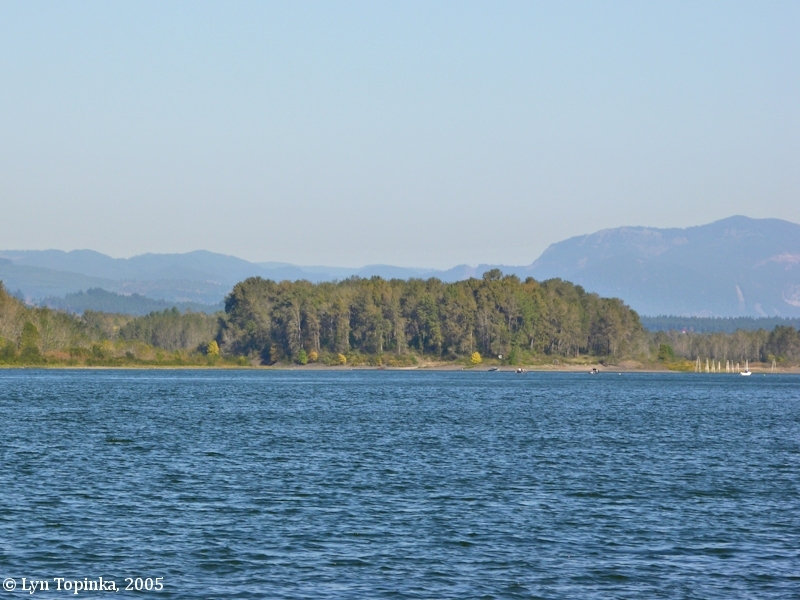 Click image to enlarge Pierce National Wildlife Refuge (left) and Pierce Island (right) as seen from Beacon Rock boat ramp, Skamania County, Washington. 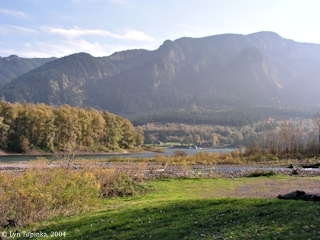 Aldrich Butte is also visible on the left. Image taken September 26, 2016. Ives Island is part of the Gifford Pinchot National Forest and is managed by the Columbia River Gorge National Scenic Area. Camping is permitted on Ives Island only. The U.S. Bureau of Land Management's General Land Office (GLO) Records database also shows Sherman B. Ives being issued a land title on July 11, 1892, for 54 acres of parts of T2N R7E, Section 30, under the 1862 "Homestead Entry Original". The 1860 cadastral survey map (tax survey) shows an un-named island in the location of today's Ives Island. Click image to enlarge Ives Island from Hamilton Island, Washington. Image taken July 2, 2006. Click image to enlarge Ives Island. View from Hamilton Island, looking downstream. Image taken July 2, 2006.
at 7 A. M. we Set out [from their camp in Shepperds Dell] and proceeded on to the Camp of Joseph & Reubin Fields [possibly near Dodson, Oregon]. they had killed nothing. 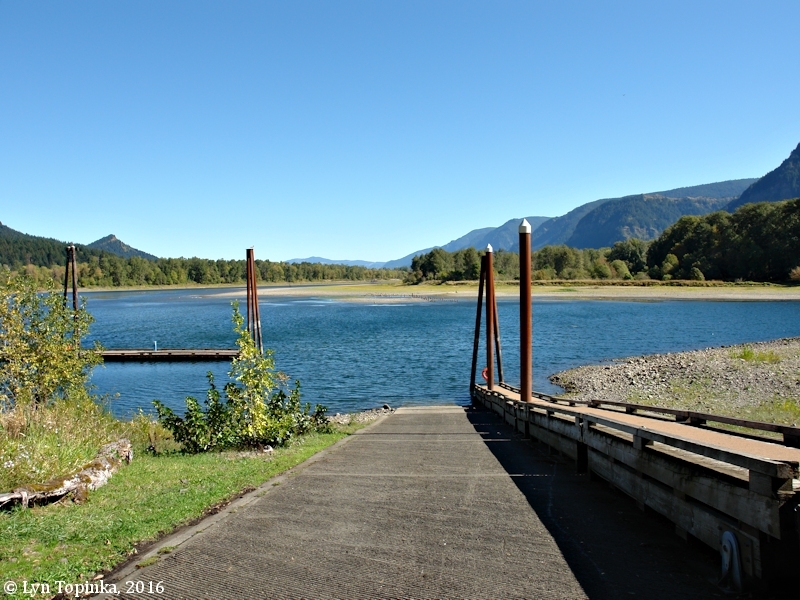 here we did not delay but proceeded on to Wah-clel-lah Village on the North Side and brackfast [upstream of today's Skamania and Skamania Landing, between Duncan and Woodard Creeks] ... This Village appears to be the wintering Station of two bands of the Shah-ha-la Nation. One band has already moved the Falls of the Multnomah which is the place they take their Salmon. The other band is now moveing a fiew miles above to the foot of the first rapid on this river, at which place they take their Salmon. 14 houses only appear occupied and the inhabitants of those moveing off hourly, they take with them in their Canoes independent of all their household effects the bark of their houses, and boards. 9 houses has been latterly abandened and 14 others is yet is thinly inhabited at present, and the remains of 10 or 12 others are to be Seen and appears to have been enhabited last fall. those people were not hospital and with Some dificuelty we precured 5 dogs and a fiew Wappato of them. ... at 2 oClock P. M we Set out and passed under the Beacon rock [Beacon Rock] on the North Side of two Small Islds [Pierce and Ives Islands[. Situated nearest the N. side. at 4 P. M. we arived at the first rapid [beginning of the Cascades Rapids, also known as the "Lower Falls of the Columbia"] at the head of Straw berry island [Hamilton Island] at which place on the N W. Side of the Columbia here we found the nativs from the last village rebuilding their habitations of the bark of <from> their old Village 16 Huts are already Compleated and appear only temporrary it is most probable that they only reside here <in> dureing the Season of the Salmon. as we Could not pass with the large Canoes up the N. W. Side for the rocks, the wind high and a rainey disagreeable evining. our Smallest Canoe being too low to cross through the high waves, we Sent her up on the N W. side with Drewyer and the two Fields and after purchaseing 2 dogs Crossed and into the Sluce of a large high Island [Bradford Island] seperated from the S. E Side by a narrow chanel, in this chanel we found a good harbor and encamped on the lower Side [near Tanner Creek]. We Saw Some deer Sign and Collins to hunt in the mornig untill the Canoes were toed above the rapids. made 16 Miles to day. evening wet & disagreeable. This morning early we commenced the operation of reloading our canoes; at 7 A. M. we departed [from their camp at Shepperds Dell] and proceeded on to the Camp of Reubin and Joseph Fields [near Dodson, Oregon] they had not killed any game; we made no halt at this place but continued our rout to the Wah-clel-lah Village which is situated on the North side of the river [upstream of the location of today's Skamania and Skamania Landing, between Duncan and Woodard Creeks] about a mile below the beacon rock [Beacon Rock]; here we halted and took breakfast. ... this village appears to be the winter station of the Wah-clel-lahs and Clahclellars, the greater part of the former have lately removed to the falls of the Multnomah, and the latter have established themselves a few miles above on the North side of the river opposite the lower point of brant island [Bradford Island], being the commencement of the rapids, here they also take their salmon; they are now in the act of removing, and not only take with them their furniture and effects but also the bark and most of the boards which formed their houses. 14 houses remain entire but are at this time but thinly inhabited, nine others appear to have been lately removed, and the traces of ten or twelve others of ancient date were to be seen in the rear of their present village. ... on our way to this village we passed several beautifull cascades which fell from a great hight over the stupendious rocks which cloles the river on both sides nearly, except a small bottom on the South side in which our hunters were encamped. the most remarkable of these casscades falls about 300 feet perpendicularly over a solid rock into a narrow bottom of the river on the south side. it is a large creek, situated about 5 miles above our encampment of the last evening. several small streams fall from a much greater hight, and in their decent become a perfect mist which collecting on the rocks below again become visible and decend a second time in the same manner before they reach the base of the rocks. [Multnomah Falls area] the hills have now become mountains high on each side are rocky steep and covered generally with fir and white cedar. ... at 2 P. M. we renewed our voyage; passed under the beacon rock [Beacon Rock] on the north side, to the left of two small islands situated near the shore [Ives and Pierce Islands]. at four P.M. we arrived at the Clah-clel-lah village; here we found the natives busily engaged in erecting their new habitations, which appear to be reather of a temperary kind; it is most probable that they only reside here during the salmon season. we purchased two dogs of these people who like those of the village blow were but sulky and illy disposed; they are great rogues and we are obliged to keep them at a proper distance from our baggage. as we could not ascend the rapid [foot of the Cascade Rapids] by the North side of the river with our large canoes [Hamilton Island area], we passed to the oposite side and entered the narrow channel which seperates brant Island [Bradford Island] from the South shore; the evening being far spent and the wind high raining and very cold we thought best not to attempt the rapids [Cascade Rapids] this evening, we therefore sought a safe harbour in this narrow channel and encamped on the main shore [Tanner Creek, Oregon]. 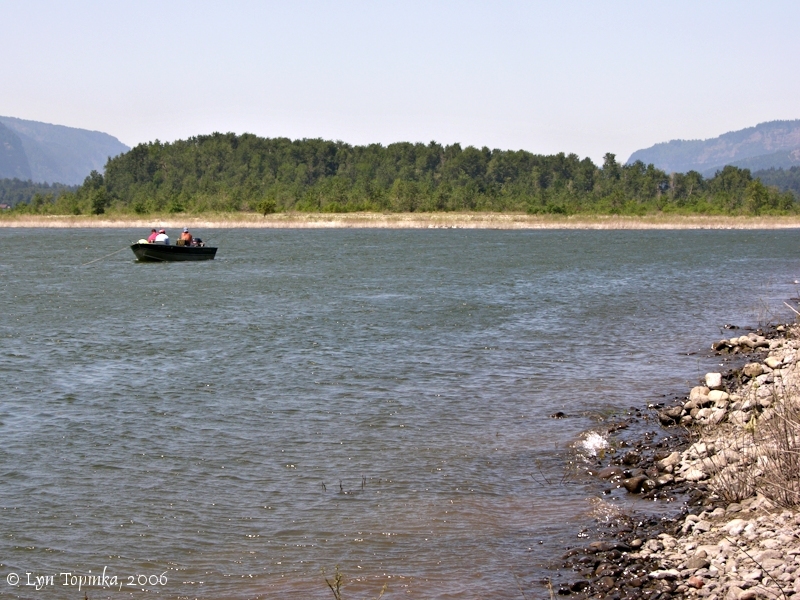 our small canoe with Drewyer and the two feildses was unable to pass the river with us in consequence of the waves they therefore toed her up along the N. side of the river and encamped [upstream end of Bonneville Dam, location of today's North Powerhouse] opposite the upper point of brant Island [Bradford Island]. after halting this evening I took a turn with my gun in order to kill a deer, but was unsuccessful. I saw much fresh sign. the fir has been lately injured by a fire near this place and many of them have discharged considerable quantities of rozin. we directed that Collins should hunt a few hours tomorrow morning and that Gibson and his crew should remain at his place untill we returned and employ themselves in collectng rozin which our canoes are now in want of.